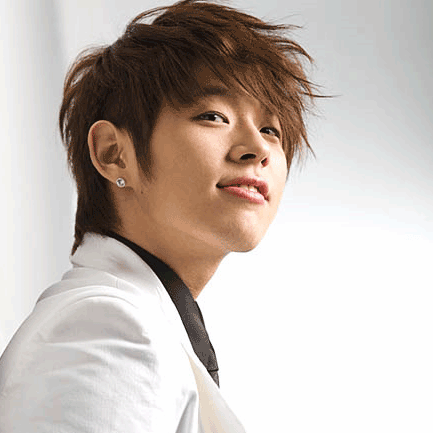 Taegoon (born Kim Tae Goon; born January 17, 1986) is a K-pop singer and dancer. His first television appearance was on the talent search program Battle Shinhwa in 2005. He reached the final round of the competition and was the last one to leave the group. Four years later, after completing hundreds of auditions he was finally able to start a career. Taegoon was born in Gongju, South Korea, the older of two children. He discovered an interest in dancing and performing when he was only a few years old. Taegoon began dancing as a child and attended an arts-oriented high school. He majored in Dance at Korea National University of Arts, but dropped out to pursue a career in singing. In an attempt to enter the music industry, Taegoon auditioned for the music competition Battle Shinhwa,. Before taking part in the show, he shaved his head, stating in an interview that he wouldn't let his hair grow until he achieved his dream of becoming a singer. While participating in Battle Shinhwa, he developed a special relationship to Kang Won-Rae, one of the judges. After he failed to make it into Battle Shinhwa (now known as Battle), he received a call from Kang Won-Rae who told him that he danced beautifully and that he wanted to get to know him. Together they went to countless auditions, but Taegoon was unsuccessful. He felt ashamed and did not have any further contact with Kang Won-Rae. Taegoon has had difficulties with his fitness level and weight. Most agencies told him he weighed too much, so he lost weight by drinking only water until he lost 20 pounds. Taegoon joined Logi Entertainment and made his debut in January 2009 after failing hundreds of auditions. With production from Sound Of Strike and Bang Shi Hyuk, his first mini album was released. He performed for the first time on the January 17, 2009 episode of MBC Show! Music Core. The song was moderately successful, and Taegoon received countless endorsement offers, which is rare for a new singer. He was signed as a model for EXR's Dressed to Kill clothing brand. .(In which, Jae Joong featured in the MV in order to help a friend). While promoting the lead single Call Me, he was heavily criticized for his heavy use of backup vocals during live performances. Because of the difficulties Taegoon was facing at this time, he quickly ended promotions for the album and went back into training. Taegoon's senior in the industry Wheesung learned of the comments about Taegoon's singing skills and offered to help. While training with Wheesung, Taegoon was required to sing Call Me over 1,000 times in order to improve his abilities. He also had to control the amounts of sleep he got, his diet, and the time he spent rehearsing and report back to Wheesung daily. After the time spent training, Taegoon began to record his next single. As a gift, Wheesung wrote and composed two songs for Taegoon. Shortly after his debut, Taegoon attracted international fans from Thailand, Japan, and other countries. In March 2009, shortly before releasing his second mini album Rising Star, Taegoon held a showcase and fan meeting in Bangkok, Thailand. Because of his album sales in other countries, he started studying the Japanese, Chinese, and English languages. On May 13, 2009, Taegoon released his second mini album, Rising Star. The single chosen for promotion was (Superstar). The single reached similar success to the previous, and the criticism towards his singing abilities had died down. Before ending promotions for the album, a remix version of the song, which sampled Holiday by Madonna, was released and promoted for a short time. In July 2009, Taegoon began his foray into Japan by holding his first fan meeting and mini concert in Tokyo which sold out, despite the fact that he had never previously released music or performed there before. Over the summer he continued his activities in both Japan and Korea while preparing for his next release. Shortly before the release of his third mini album, Taegoon held a special event for his Japanese fans and spent one night and two days with them at Mount Fuji in Japan. He also released a special album exclusively in Japan, CALL ME / Rising Star, which was a compilation of his first two mini albums in a two disc set. After returning to Korea he released the third mini album and began promoting the single (Betrayed) on September 17, 2009. During the period of promotions for this single, Taegoon also began activities outside of singing like appearing on variety shows and talk shows. After several months, activities for the album ended. He went back to Japan and successfully held several special performances in Japan before holding his first official concert, TAEGOON White Love 2009. The concert was held in Tokyo, Japan on December 11, 2009 and sold out. Taegoon then began preparing for his first full length album. In April 2010 it was announced that Taegoon would begin his acting career by starring in the movie Piano Above the Sea.